Okay, you guys, I have to admit it. 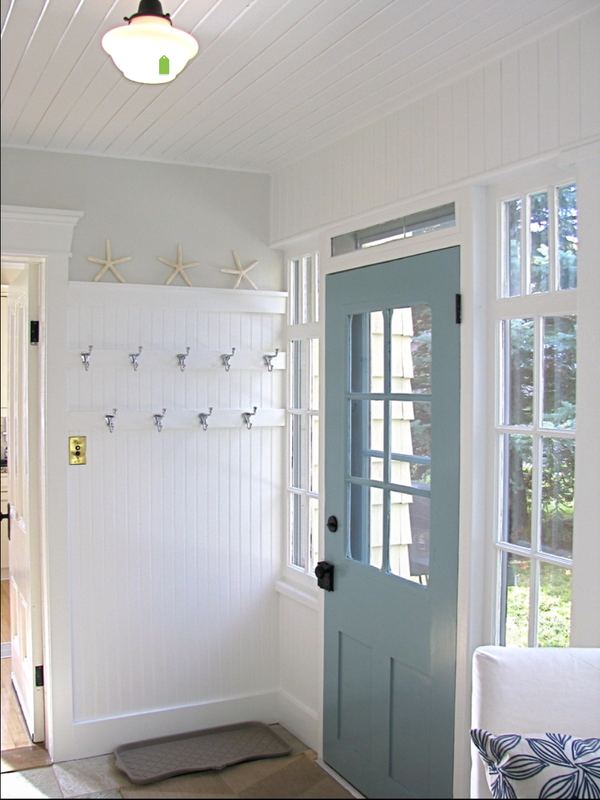 I’m kind of obsessed with mud rooms. 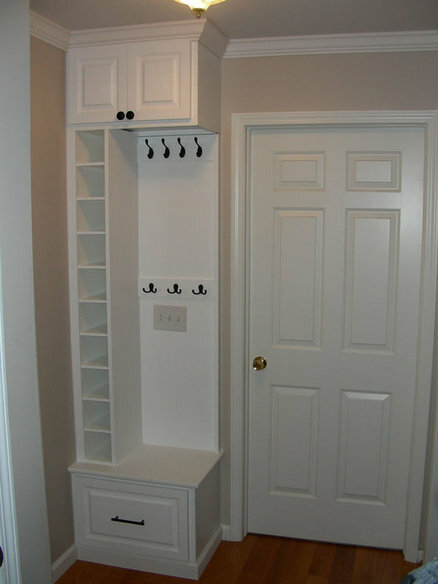 I’m talkin’ about dreamy, huge, beautiful, white panelled mudrooms full of custom built perfectly organized cabinetry. So, in other words, I’m obsessed with a dream. 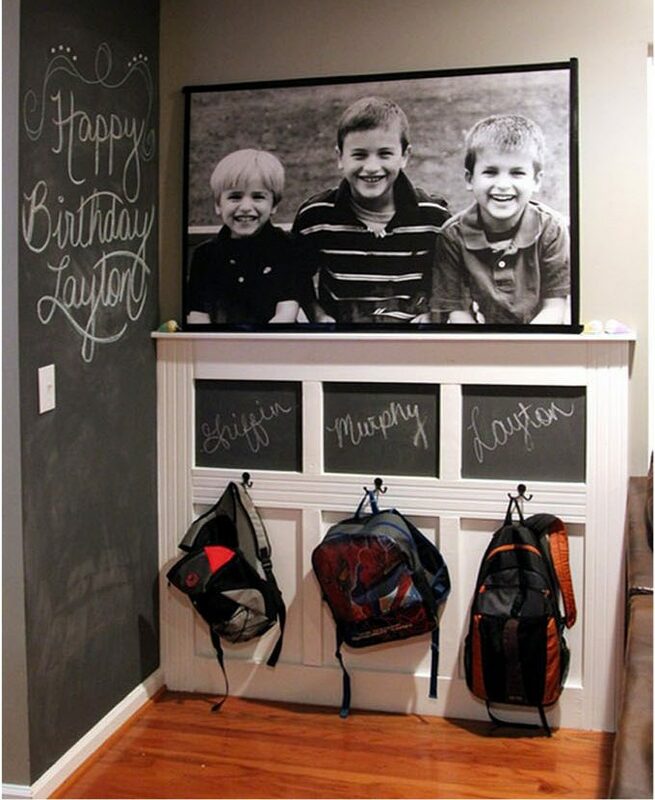 A dream that likely never-will-be within the confines of the 4ish’ by 10′ hallway/mudroom/laundry room that we have. And, I know…. I know I should be grateful to even have a main floor laundry room. 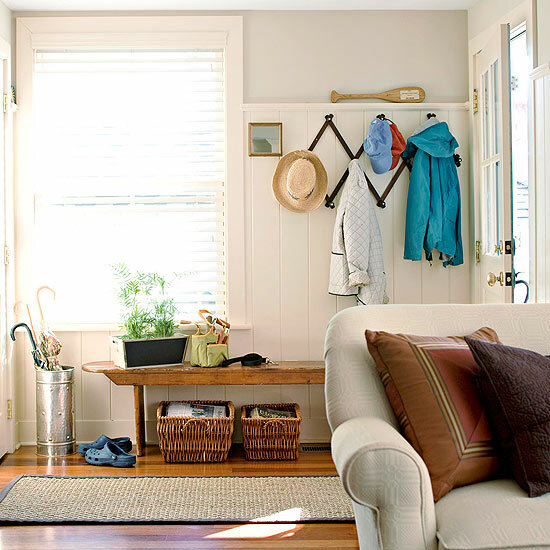 Or a mud room (if you can call hooks on the wall a mud room). Or an attached garage. Those are all really wonderful things that we are so lucky to have. But I have to tell you. Our space is not all that functional right now. 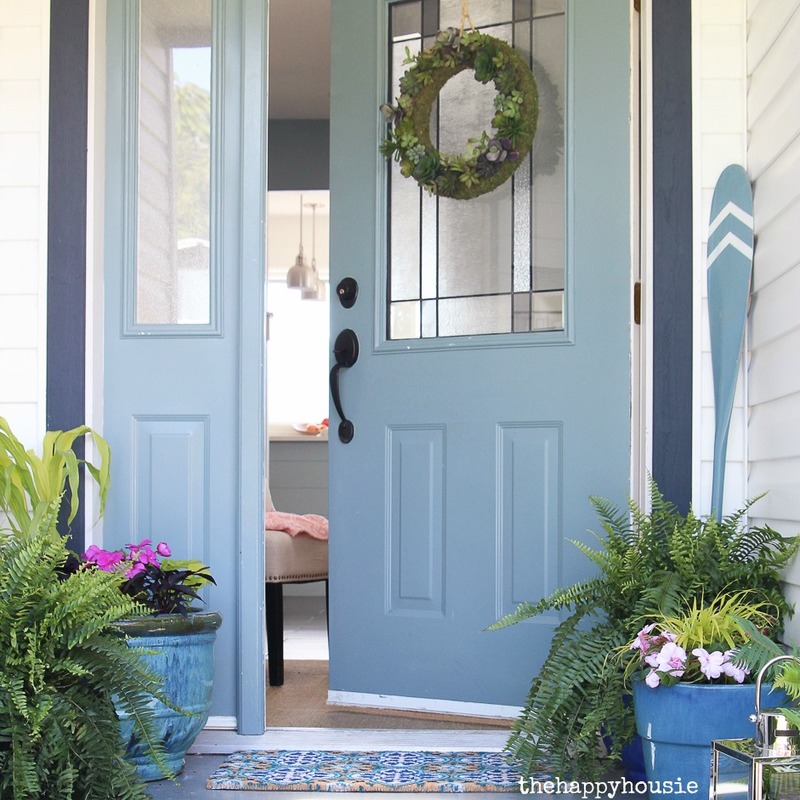 And even though it might not seem like a big deal; having our mud room/entry area so disorganized and non-functional causes me a lot of stress. It feels like it’s constantly getting jammed up with junk. The laundry countertop ends up becoming a drop zone. The hooks get overloaded. It’s a depository for all things ‘waiting’. It’s basically the purgatory of our house. So, there are definite issues. 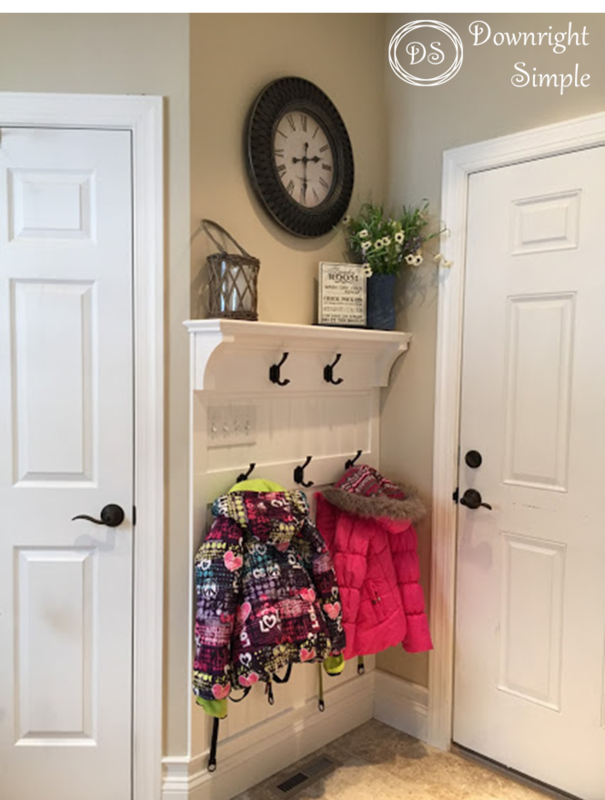 But instead of venturing into that dreamland-of-mudrooms and filling this post with stunning custom outfitted mudrooms the size of my main floor, I’m going to stay focused on problem solving for small mud room and entry spaces. Like we have. 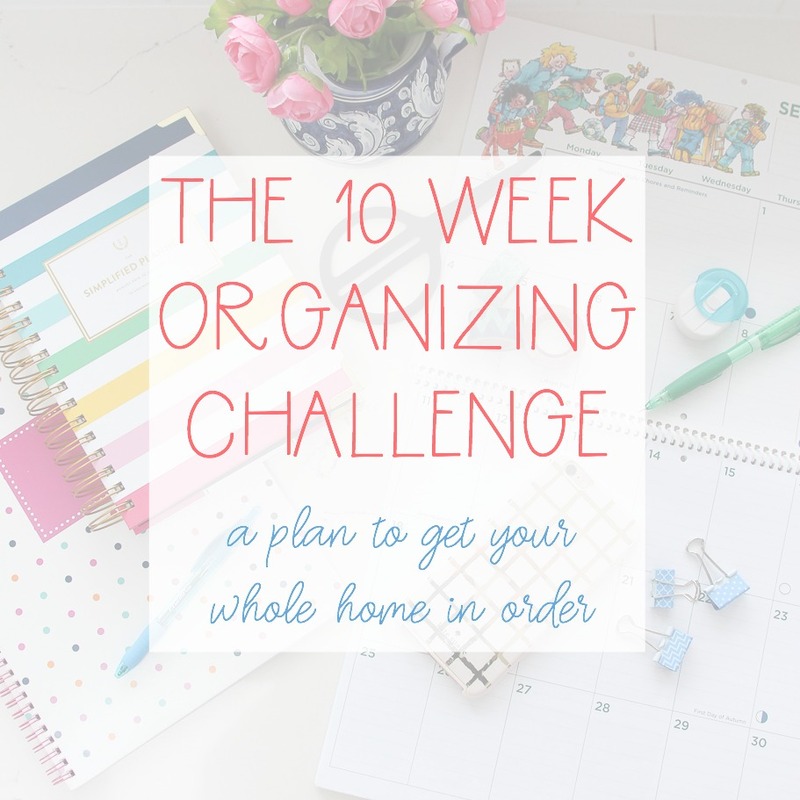 So, while I’ll be back tomorrow to share our laundry room organizational makeover… it may take me an extra day or two to reveal the mud room. It’s definitely still a work on progress. For now… let’s do some research, shall we? 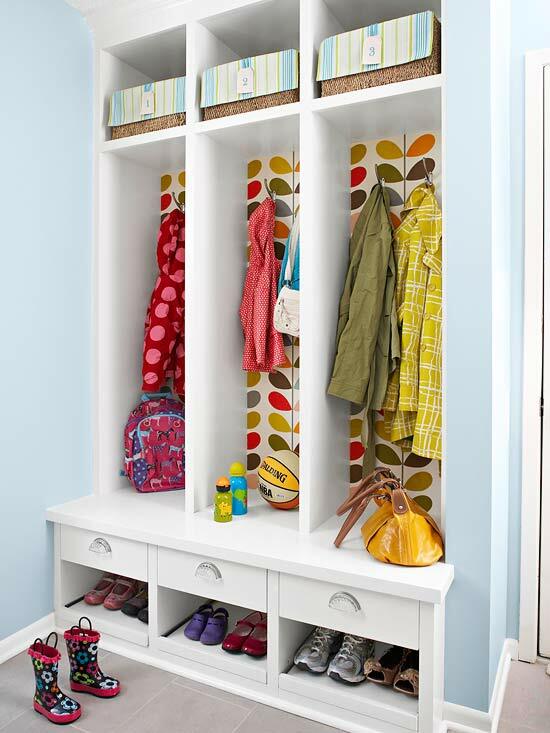 Let’s study up on ideas and inspiration for how to carve out an efficient and organized entry or mud room in a small space! 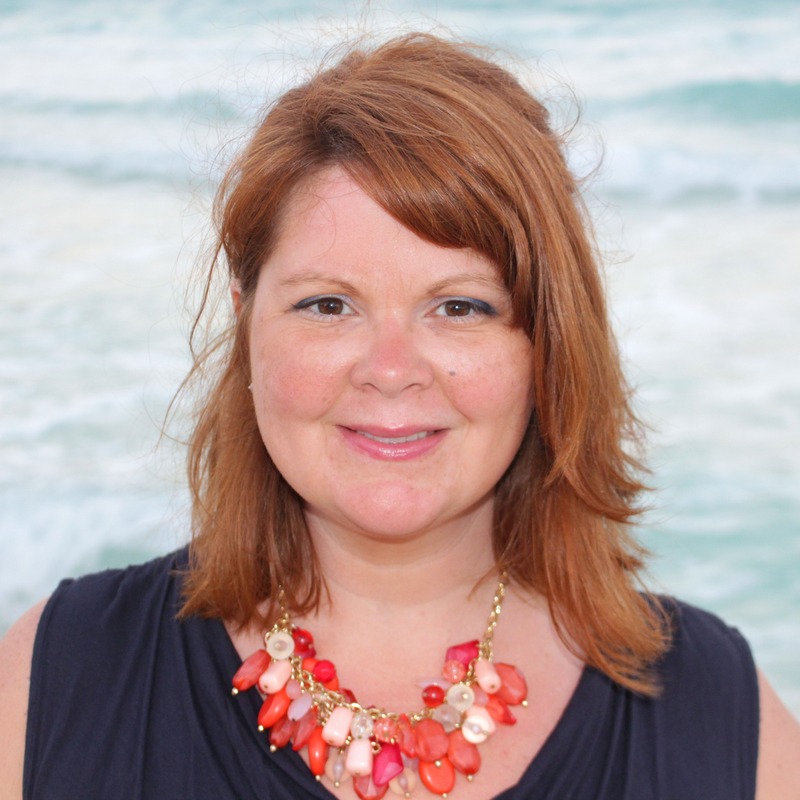 Are you in an organization funk? 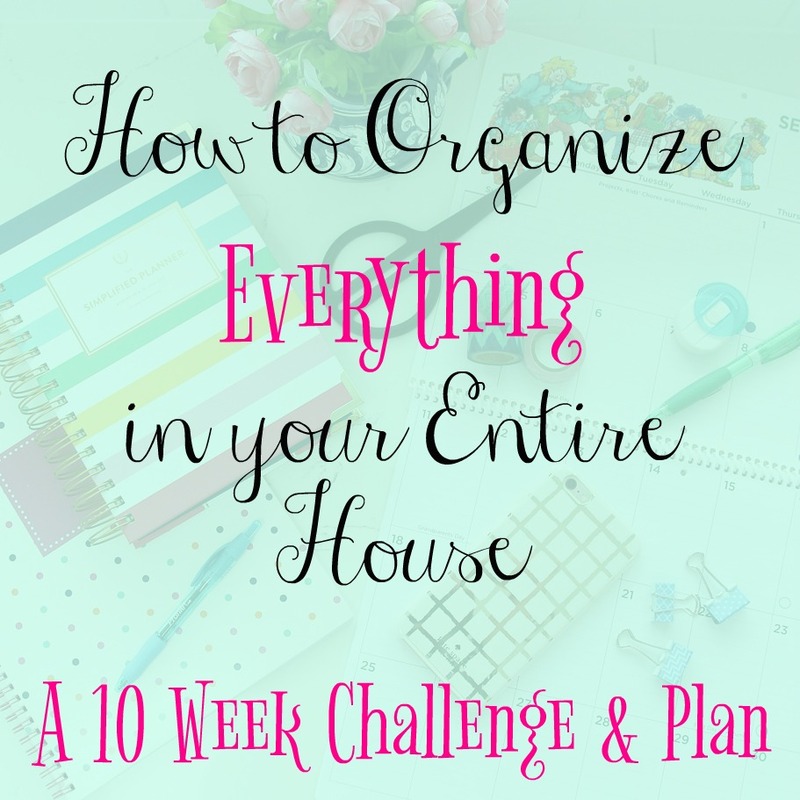 Or trying to tackle your home organization goals once and for all? 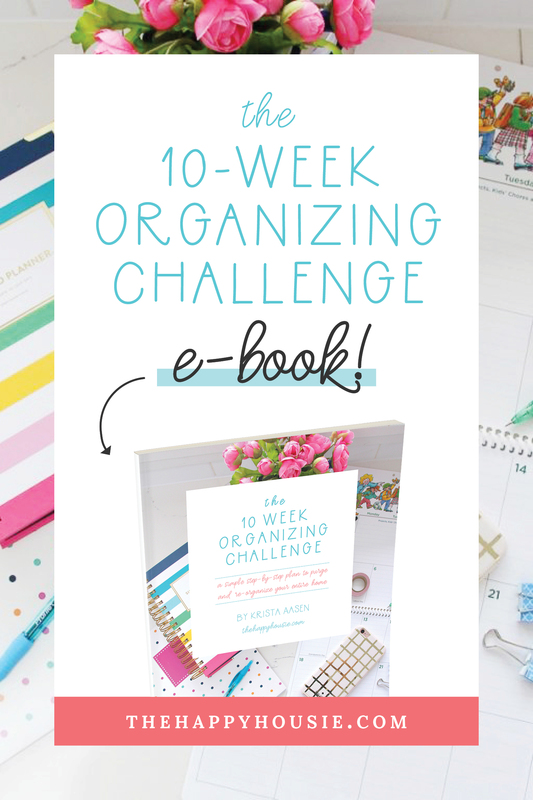 Well, then you might be interested in my ten week organizing challenge! You can read all the details here! 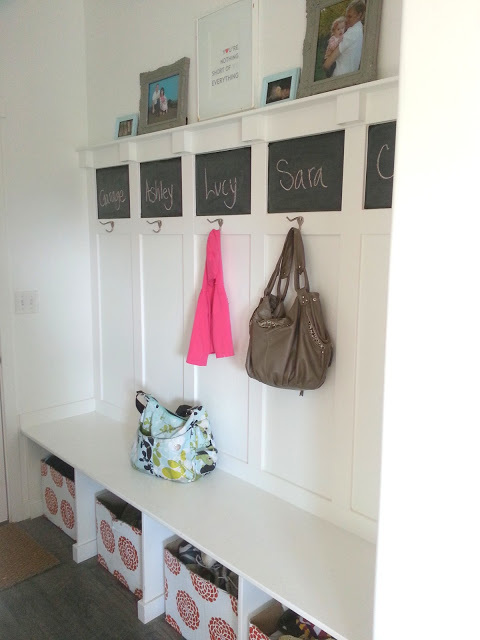 This week’s challenge is our Laundry Room and Mud Room. 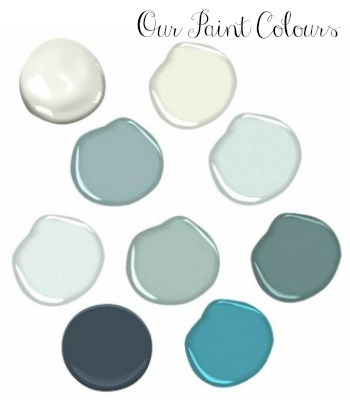 These two spaces don’t necessarily go together in all homes; so I’m trying to treat each of these issues separately. 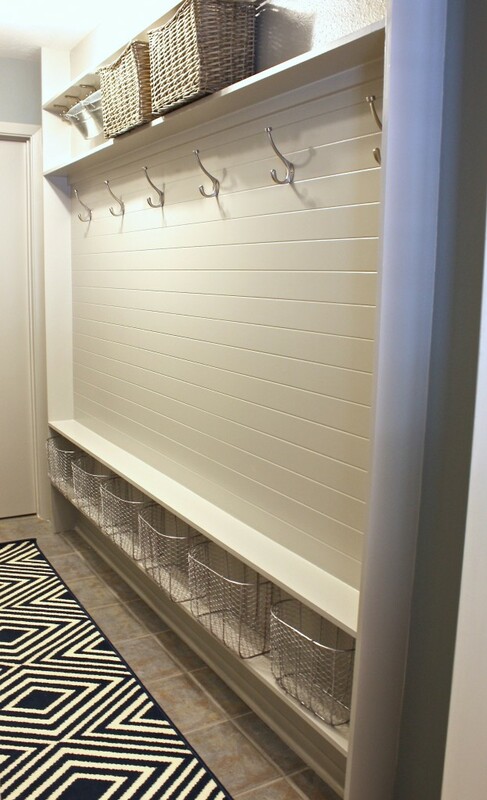 I shared 20+ beautiful and organized small laundry rooms the other day; and today I’m focusing on small space organized mud rooms and entries. 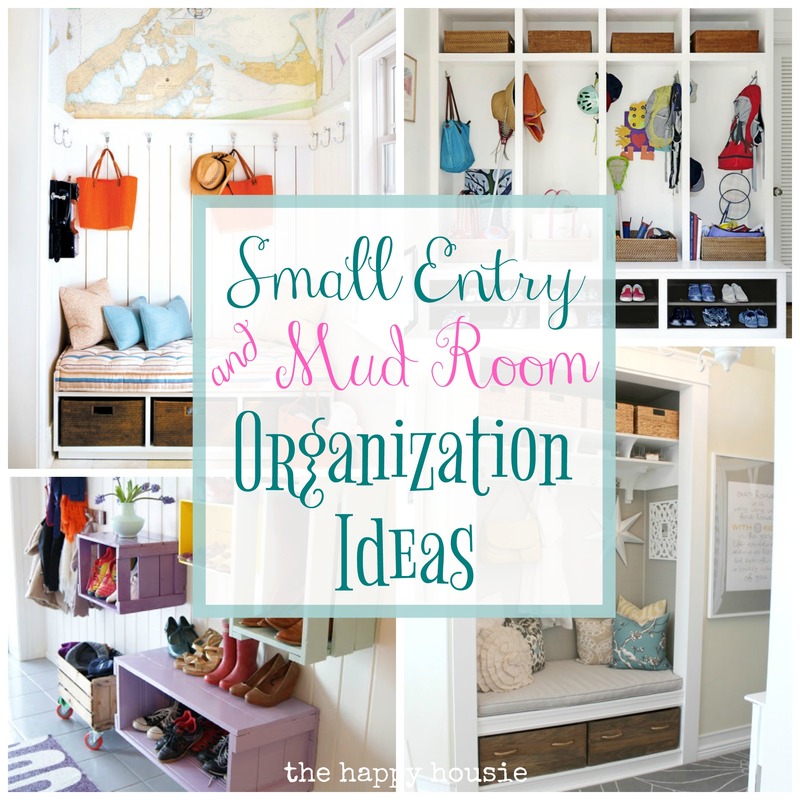 You can see even more fabulous inspiration and ideas on my Pinterest Board: Mud Room Organization and Inspiration. 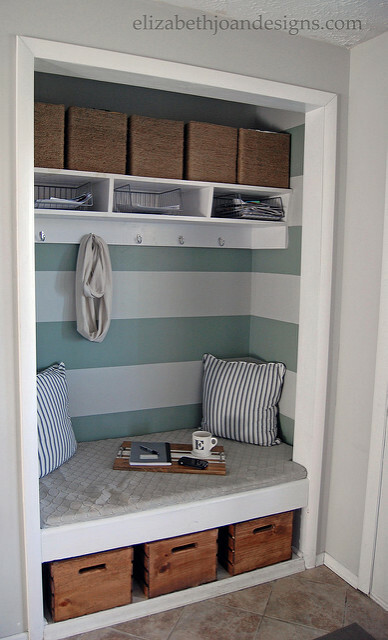 I don’t know what exactly it is about this mud room and (I’m assuming) laundry room combo, but overtime I see this picture Via houzz my heart jumps. Does it have effect same effect on you? 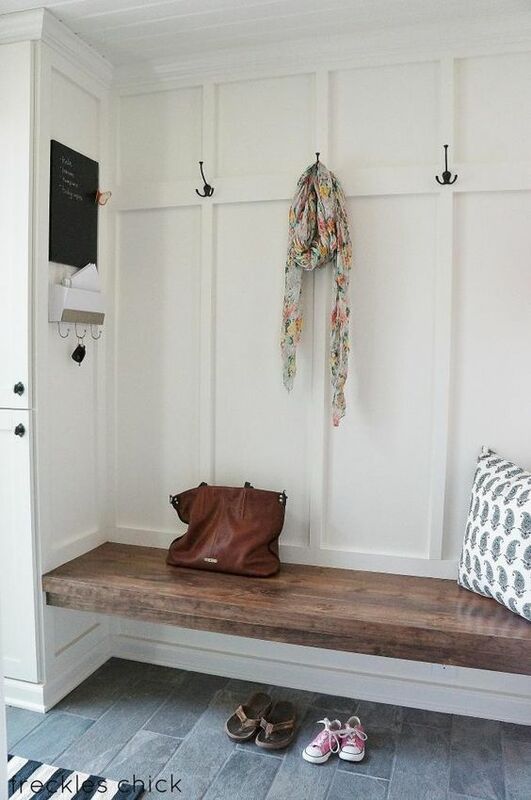 I know it might not qualify as “small”, but I figured the actual mud room/entry bench is fairy small so you definitely could adapt this design to a smaller space. 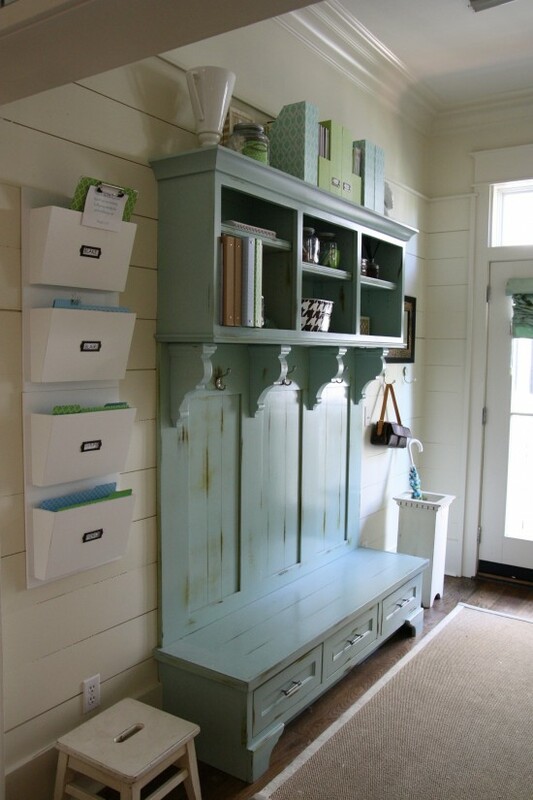 If you don’t have built-ins then a beautiful piece of cabinetry in a fun colour might be a great way to go to add extra storage and function to your entry – like this stunning piece Via Simply Seleta. I like how she has combined a bit of a mail/command center area here as well. 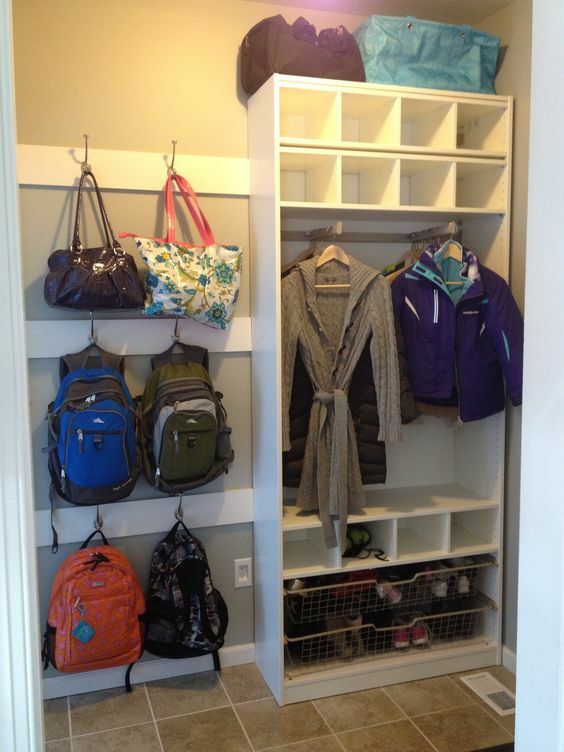 Over at The House of Smiths they turned a front closet into a mudroom area – or at least into an organized and functional entry spot. 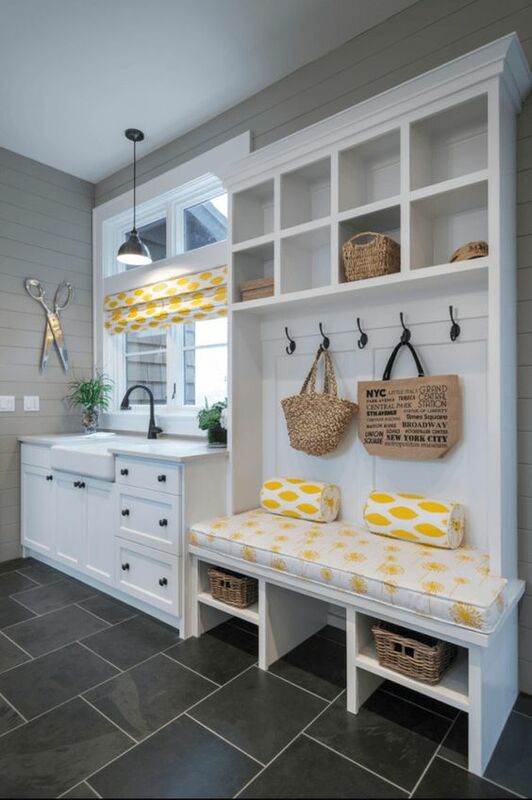 I love the pullout wooden drawers and the storage bins and baskets above the bench as well. 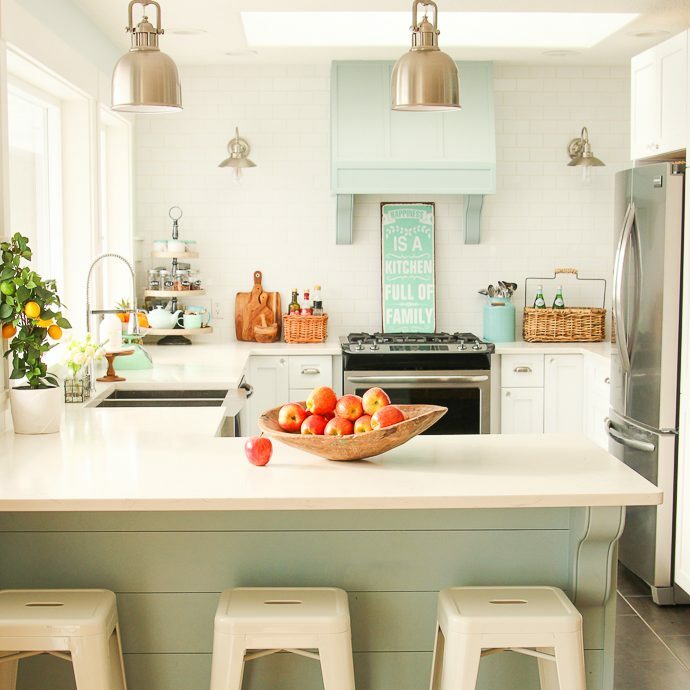 You’ll want to see how they started -it’s a pretty amazing change! 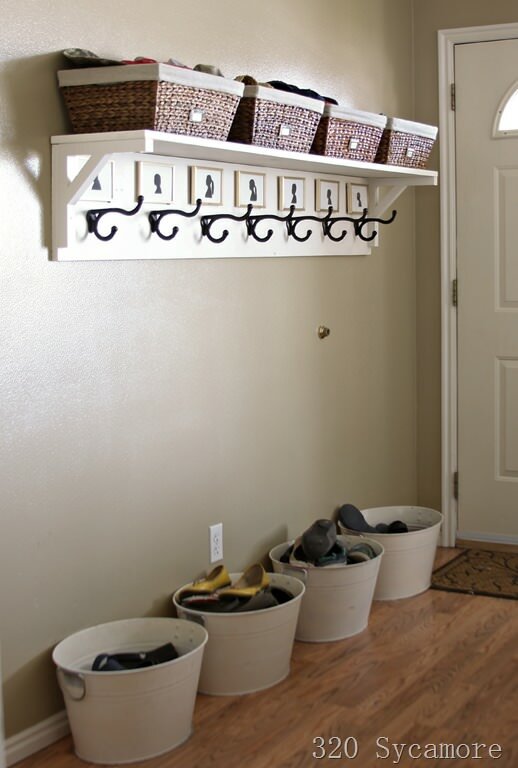 I love how simple she kept things at 320 Sycamore – shoe buckets, hooks, and baskets! 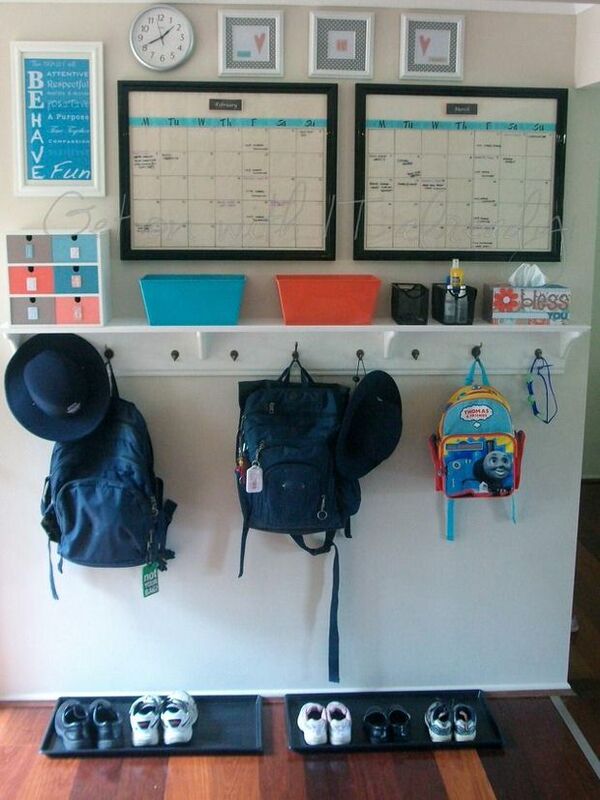 Brilliant, thrifty, and so functional!! My kids throw their shoes all over anyhow, they might as well be in a bucket! 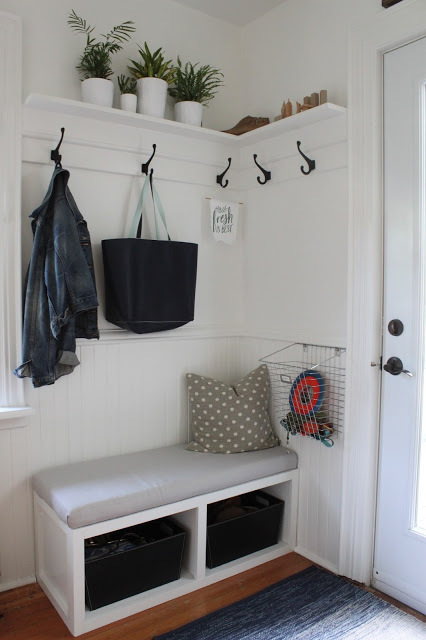 I love how much function was packed into this one little wall – and with such beautiful character Via bhg – a simple rustic bench with basket storage below it; the umbrella stand, and pretty but functional runner rug, and totally creative wall hooks! Brilliant. 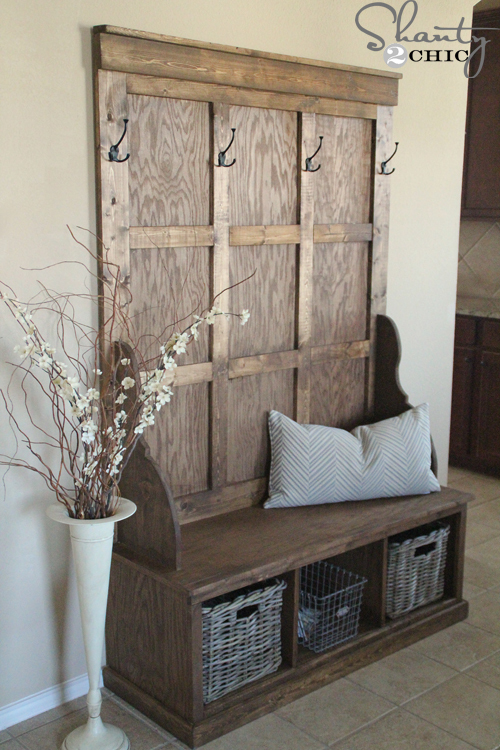 Everything that Lucy at Craftberry Bush does is beautiful; but this huge thrift storage piece that she turned into an entry cabinet is also super functional. 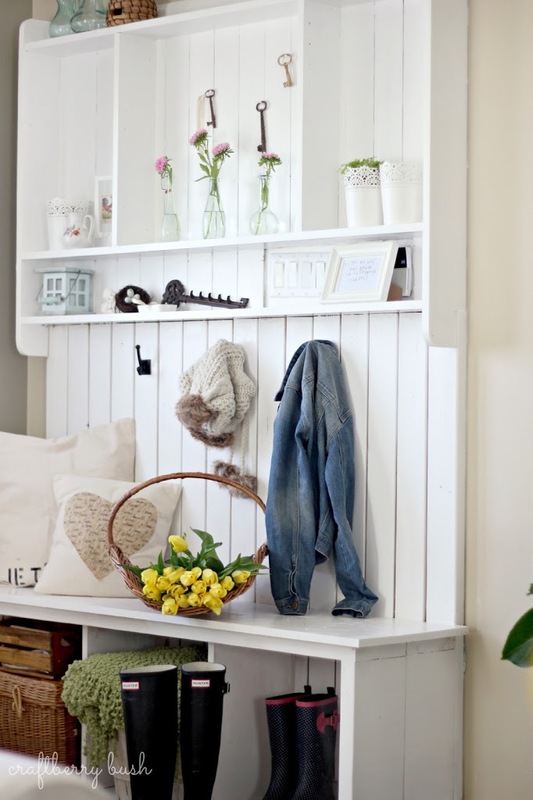 The big space below the bench could be used for all kinds of practical storage, and the space above could be for a mix of pretty and functional. Sometimes free-standing pieces are the way to go. 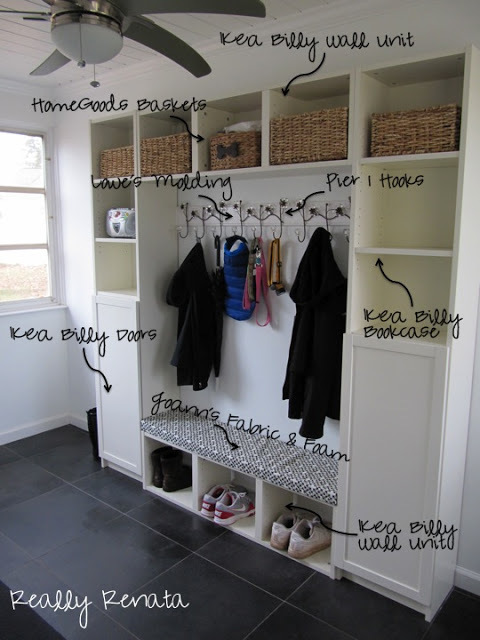 I love this Ikea Hack Via Pinterest (if you know the original source let me know) – Billy Bookcases and a shoe bench?? 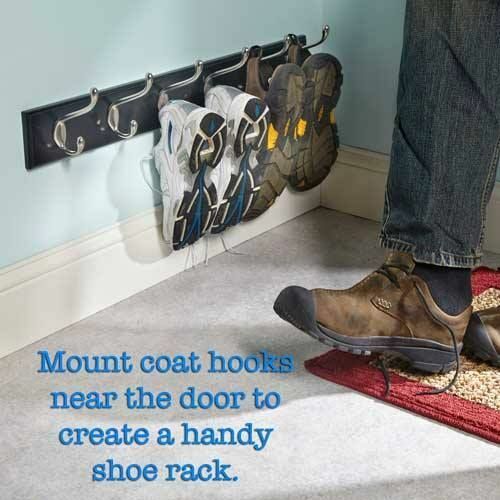 Thrifty and easy to find- plus simple to move around if needed. 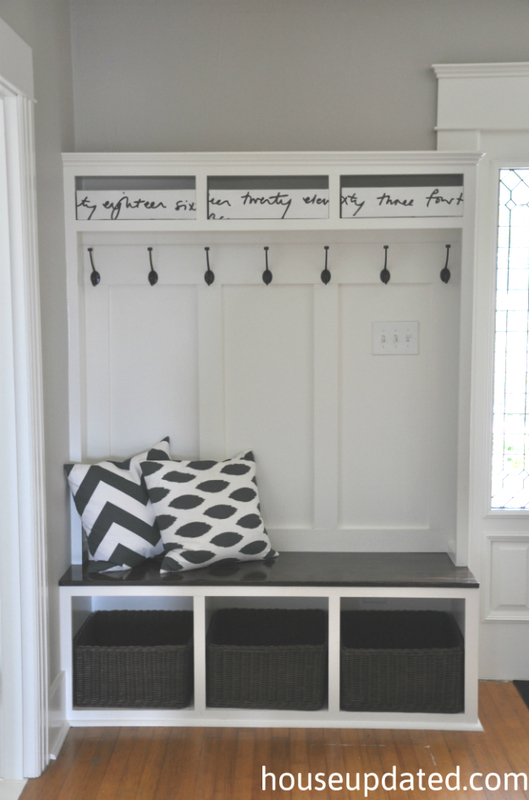 The chalkboards in the paneling add an extra fun and personal touch to this mud room bench Via Nifty Thrifty Momma – and I love the big bins below for shoe storage. 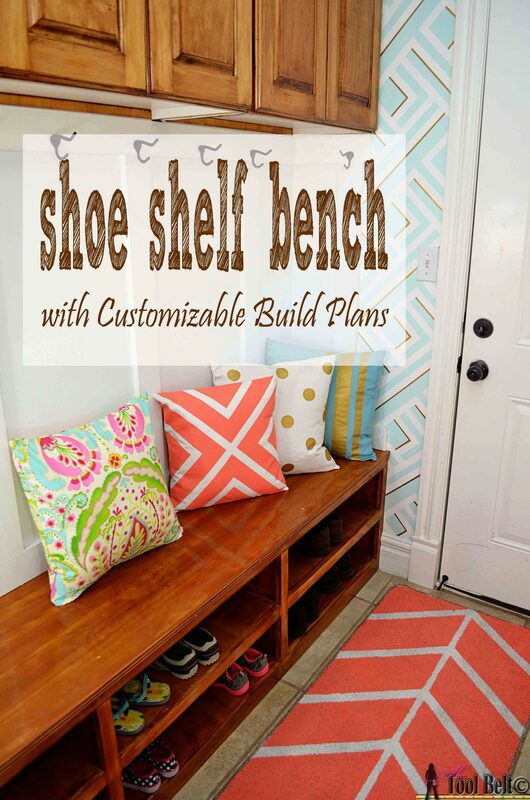 I love this built in bench Via Freckles Chick – in fact, I think something like this would be perfect for our mud room alcove. 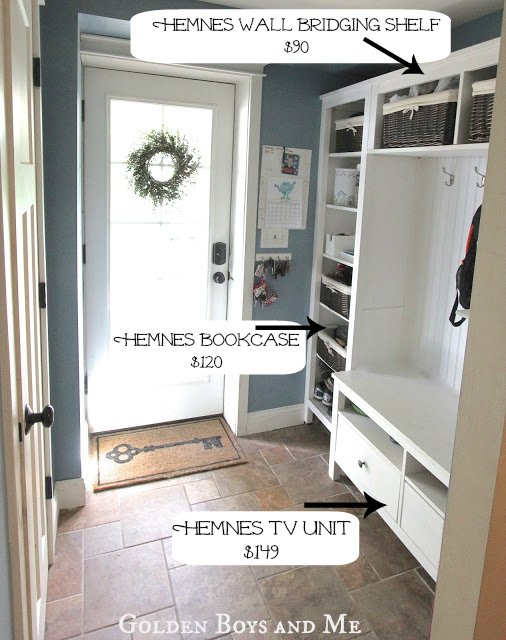 Over at Golden Boys & Me they used Ikea Hemnes units to create a built in mud room area in their back entrance, and the cabinetry looks amazing! outstanding collection of ideas. we will be moving soon so this is a great post that i could really use. 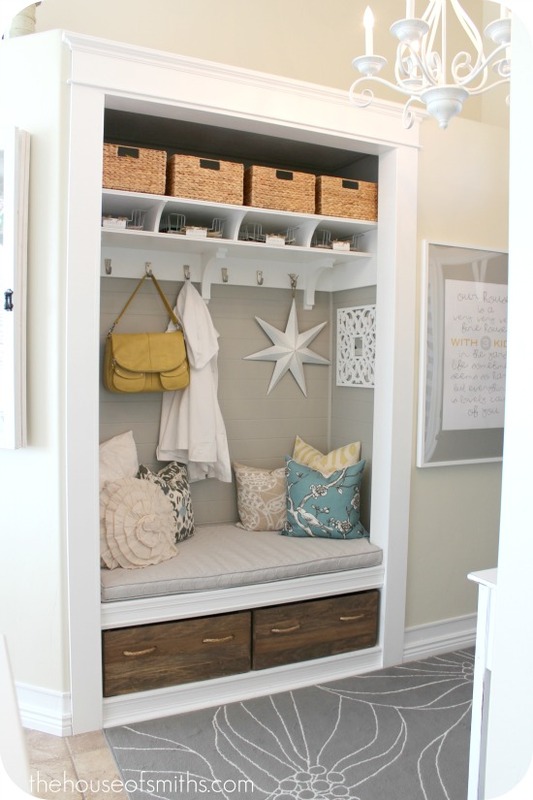 I love the thought of these mudrooms, too. The likelihood of me having one of these gorgeous ones, is pretty slim. But I do like having a set of hooks by the door and a couple of bins to throw things into underneath of it. Hi Stephanie! 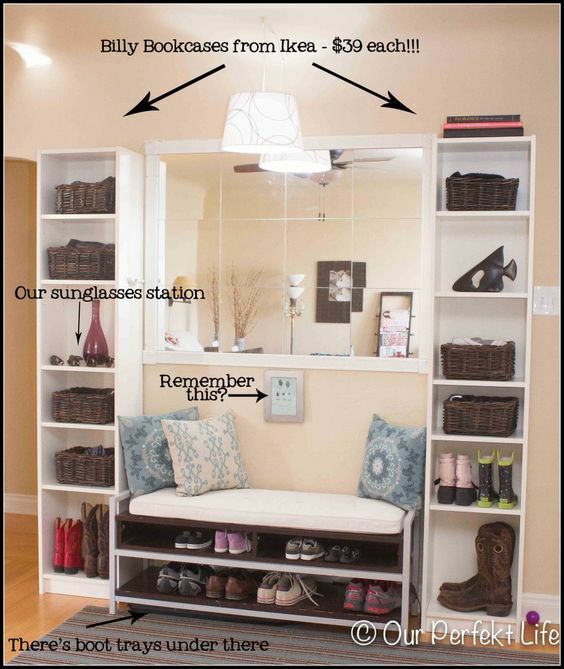 I like that idea of bins on the floor to throw things into – super handy for kids because they will actually use them!